Artist’s rendering of Solara 50 at high altitude. 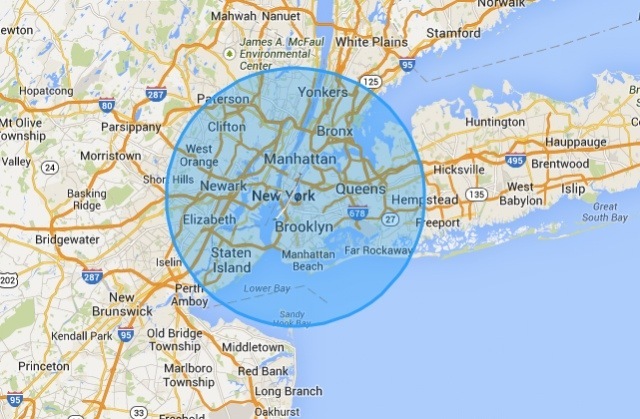 The coverage area of a Solara 50, superimposed over New York. Titan’s aircraft plans are … modest and … ambitious at the same time. Solara 50 will have a payload of just 70 pounds—though depending on the time of year and location of the flight, longer daylight hours could sustain flights with heavier payloads. The next design, the Solara 60, will carry up to 250 pounds. Instead of using hydrogen fuel cells, the Solara aircraft use batteries charged from solar panels to power flight at night and provide about 100 watts of power to the aircraft’s payload, as well. The Solara 50 has a 50 m (164 feet) wingspan. The upper surfaces of its wings and tail are packed with over 3,000 photovoltaic cells capable of generating up to 7 kilowatts. It is launched by catapult and can land (when it has to) by skidding on its Kevlar-coated underside. Unlike the giant flying-wing configurations of the Helios and Zephyr, which had large numbers of propellers, the Solara has a single, high-efficiency motor. 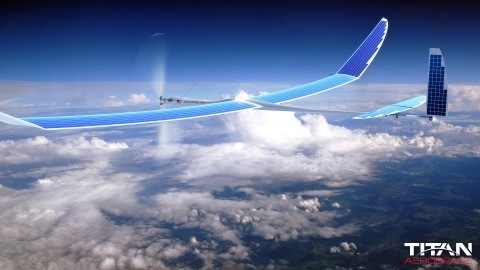 In theory, a solar-powered drone capable of withstanding long flights at high altitude—in what Titan executives call the “sweet spot” in the Earth’s atmosphere between 60,000 and 70,000 feet, above nearly all weather patterns in a zone where winds are typically less than 5 knots (5.75 miles/hour)—would be able to perform tasks usually reserved for satellites at a much lower cost. Several orders on the books, reasonable objectives, good idea, what’s not to like? This entry was posted in Aviation, Technology and tagged persistent, relay, Solar, UAV by Sci Fi Engineer. Bookmark the permalink.